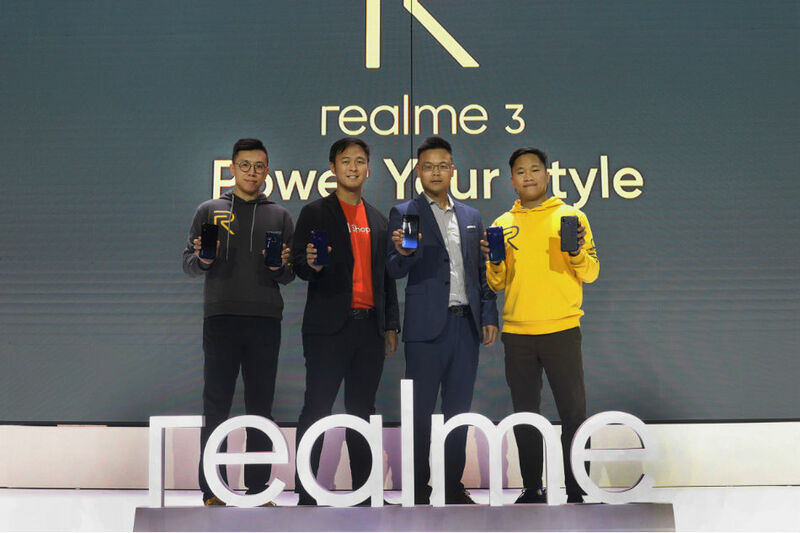 Photo above shows (from left) realme Philippines COO Jacky Chen, Shopee Philippines Associate Director Martin Yu, realme Philippines CEO Neil Zou, and realme Philippines Marketing Lead Eason De Guzman during the launch of the newest value and midrange smartphone segment disruptor, the realme 3. The realme 3 comes with features unrivaled in its price segment. For only P6,990, the phone boasts a MediaTek Helio P60 processor which consumes significantly less power than other phones’ 12nm process chips— making realme 3 the strongest segment entrant today. The phone’s cameras feature improved hardware configuration with a 13MP front camera and a 13MP main camera + 2MP secondary camera rear duo. The cameras also have two firsts in its price segment: Nightscape mode optimizes camera performance in low-lit environments, while the Chroma Boost feature uses AI technology to identify objects, optimize photos, and improve the image’s overall dynamic range. Realme is focused on continuously innovating the mobile phone aesthetic and tactile experience. In order to achieve a better grip and visual integration, the realme 3 deviates from the "sandwich" format of screen-middle frame-back cover. It instead utilizes a 3D gradient unibody for better ergonomics and implementation. To give young customers the best visual experience, the realme 3 uses gradient color matching in its two color variants: Dynamic Black and Radiant Blue. The realme 3 with 3GB RAM and 32GB storage priced at P6,990 will be exclusively available online through shopping platform Shopee. “Realme has been a huge hit among our Filipino users since they launched their official store on Shopee Mall in January. Hence, we are excited for the exclusive launch of the latest realme 3 smartphone on Shopee to bring our users first-hand access to yet another premium device from realme. We are very happy with this partnership so far, and shoppers can look forward to more exclusive products and promotions on Shopee Mall in 2019,” said Martin Yu, associate director of Shopee Philippines. Its offline variants - 3GB RAM and 64GB storage; 4GB RAM and 64GB storage are priced at PHP 7,990 and PHP 9,990, respectively. These are available through local distributors and kiosks nationwide starting April 6. Customers may pre-order the offline variants from March 20 to April 5 with a minimum deposit of PHP 500. Those who pre-ordered are going to receive freebies worth PHP 1,299.